This is maladministration and so on. The weird scene that some how disheartened and totally bizarre was the sporadic shooting by the security agency at saraki mandate arena which caused two female law students to be fainted and brought them into coma. As they both collapsed the thugs that are permanently fixed to mandate, while on pay roll like those that were just being transfered to abuja for murdered case, speedily approached the ground to cover the victims and carried them into unknown destination within the premises. Presently we don't know their condition. The Director General of the mandate 'Alhaji Musa Abdullahi Ore, Director of Project 'Yinka Otukoko and others were inside pretended as if they weren't aware of what was going on outside that almost take a life of an innocent law students. 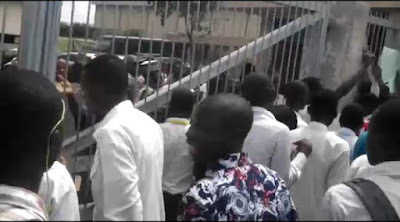 The stupidity of these people was that they ought to leave the thugs/hoodlums, that have no first school leaving certificate, to be addressing the protesters, the law students in possessions of presentable SSCE which gives them the glory to be an undergraduate law students. I can first in my life see where thugs are addressing an educationists at protest in Kwara State. I can first see where government were releasing bullet to address the students. I can first see the state where thugs are recognized over the students. Your days are numbered. Culled from TVC kwara.